The iMac's processor has been upgraded and now houses a 7th-gen Kaby Lake 3.8 GHz Intel Core i5 Quad-Core processor that can be overclocked up to 4.2 GHz, as well as 16GB of 2400 MHz DDR4 RAM. Visuals are powered by a dedicated AMD Radeon Pro 580 graphics card with 8GB of vRAM, and for storage, there is a 2TB Fusion Drive. 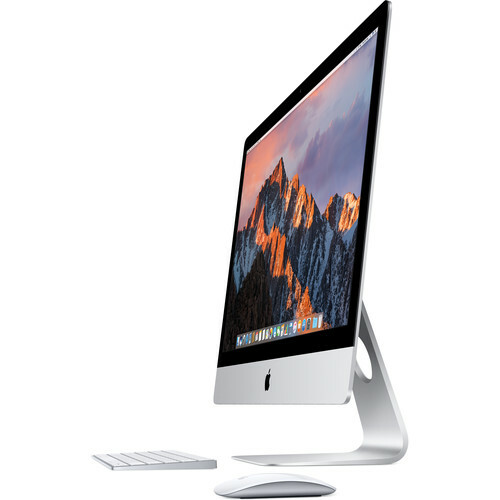 The iMac houses a 7th-Gen Kaby Lake Intel Core i5 Quad-Core processor that can reach a stock speed of 3.8 GHz. It can also be overclocked up to 4.2 GHz, thanks to Intel Turbo Boost 2.0 technology. The 7th-gen Kaby Lake Intel processor uses low voltage for better energy efficiency while still providing fast performance needed to run processor-intensive applications such as Logic Pro or Final Cut Pro. Combined with 16GB of 2400 MHz DDR4 RAM, the iMac allows you to multitask quickly and efficiently.